Tales of the Trails: up in the new Lepsoe Basin cabin, there was – and should still be – a copy of a slim volume of ditties penned by “The Convert,” real name John Forrest, who described himself as “an old retired Red Mountain ski patroller and downhill fanatic now addicted to tall tales and the companionship of old guys. (Real old guys. )” It’s illustrated by photos of some of the “old guys” and some hand-drawn sketches. Many locals knew and loved the "old guys" named in this little book, besides their family members. A few excerpts from the booklet are shown below. This volume and the tales it documents were based on using skinny skis, on which the old-timers explored the hills around Strawberry Pass and Moose Lake and the Paulson summit. Now, skiers accessing those areas may use skinny skis or fat Alpine Touring skis, or fish-scales. Others venture out on snowshoes or, when the trails are packed hard, fat bikes or just their boots. And we're now much more likely to see large numbers of other people out there. To find solitude, a person must go off the beaten track. Visiting the new, more hygienic cabins – with floors of wood rather than dirt mixed with wood chips – many newcomers may not have seen the old “trespass” cabins. 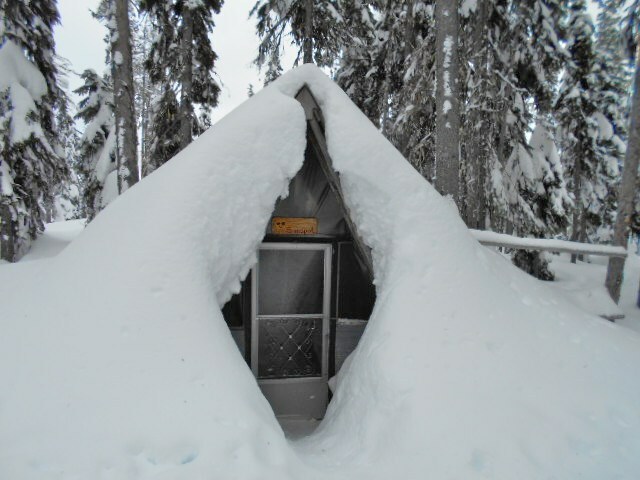 The old A-frame pole-and-tarp structures sheltered many a happy winter explorer and heard many tall tales. They also gave rise to the current Rossland Range Recreation Site and the new, legally authorized day-use cabins that shelter us. Here’s a toast to the “old-timers” who started it all, and the amazing legacy they left for all of us to enjoy! Just a few of them are picured below.